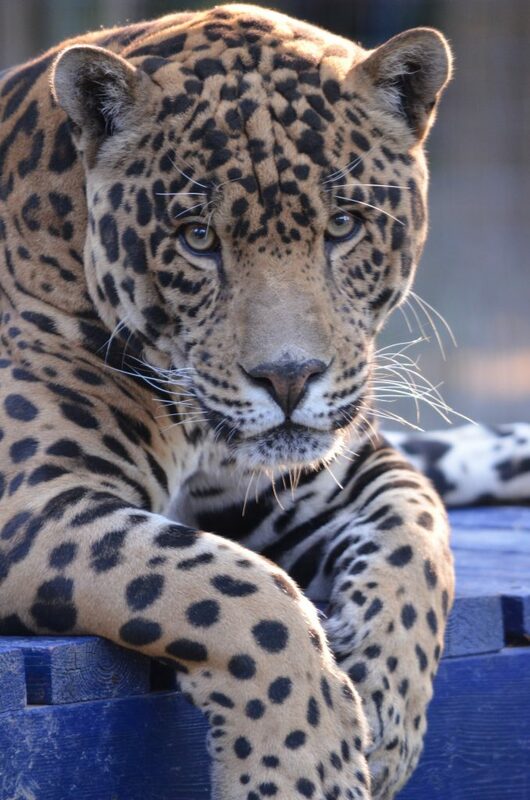 The first pair of cats you will meet when entering the zoo are our jaguars, Rose and Voodoo. Rose, although an old girl at 19 years old, still loves playing with all her toys in the playground with a special favourite being the tires. Voodoo is an impressive black jaguar, and if you catch him in the right sunlight you will see the characteristic rosette spotting of a jaguar. The two have just been introduced together this past spring. Mickey Jaguar is similar in colour to Rose but being male, is much larger. See him up close in his playground as Mickey loves to hangout by the visitors trail – he is very much the people watcher. Come see the new jaguar run in 2018 with a brand new swimming pond! 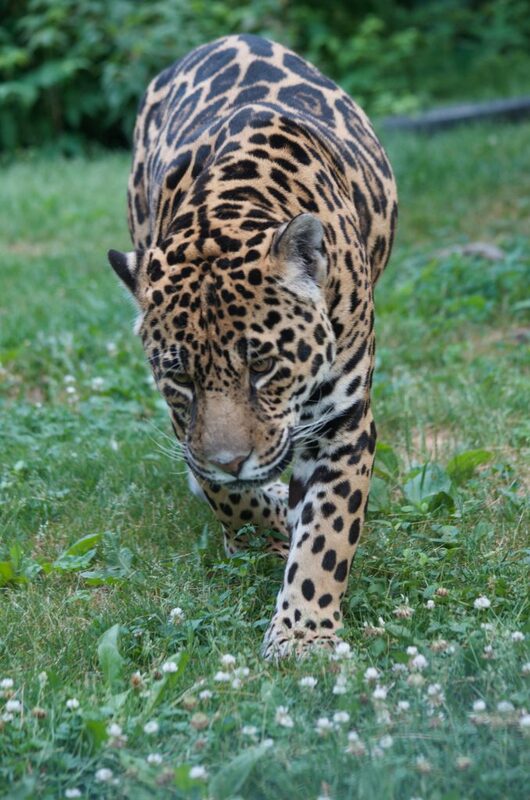 Native to the Americas, the jaguar is the 3rd largest species of cat. Similar in appearance to the Leopard, the Jaguar is much stockier and of heavier build. The jaguar has one of the most powerful bites in the feline family, which allows a unique killing technique of attacking prey directly on the skull. This ability also widens the opportunity for more difficult prey, such as turtles! The jaguar is an avid swimmer, and can carry prey while swimming. A black jaguar is a melanistic form which occurs in roughly 6 % of the jaguar population. 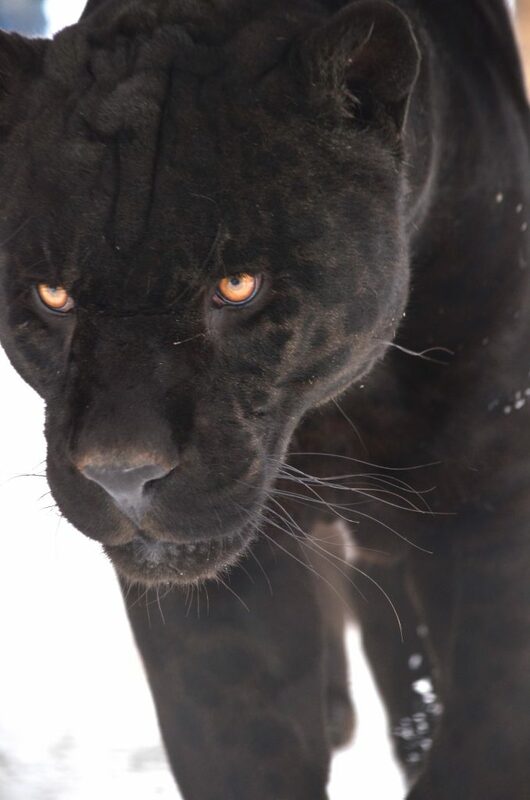 Although referred to as a Panther, the black jaguar is not a separate species from regular coloured jaguars but is essentially a colour morph. 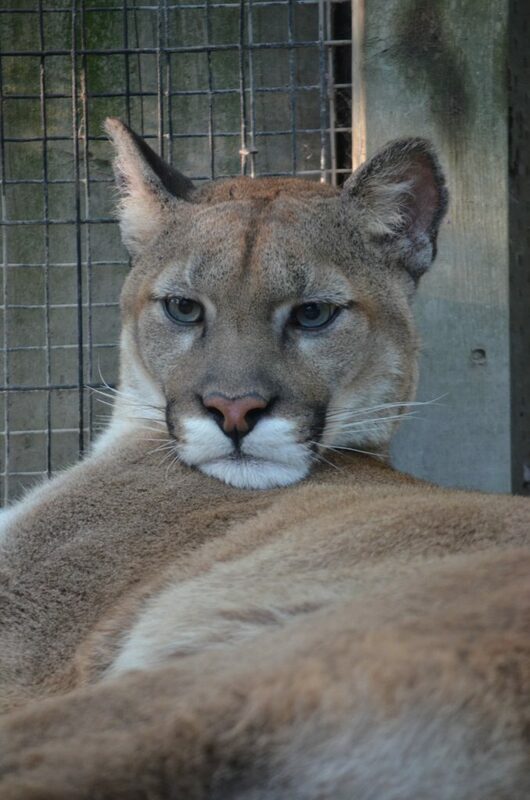 The cougar enclosure has been revamped to accommodate our cougar pair, Zoey and Oden. Recently introduced together, the two are settling nicely into their new 12 foot high home. Make sure to look up as their favourite hangout spots are on the highest platforms. Little known fact, the Killman Zoos first cat was a cougar in 1979 and now after 30 years we are in our 4th generation of cougars. Often referred to as mountain lions or pumas, cougars are native to North and South America, and are the largest mammal in the Western Hemisphere. They are solitary mammals that are very adaptable to their environments making them able to live in many conditions such as coniferous forests, to grasslands, and to deserts. They are excellent climbers and have strong legs in which they can jump up to 6 feet high. Their prey includes deer, elk, or moose. 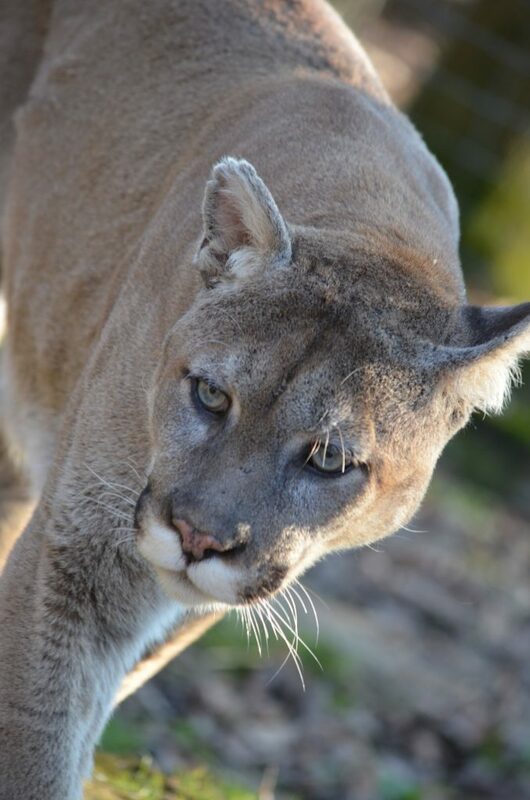 Contrary to popular belief, the cougar is not apart of the Big Cat Family with the lions or tigers, but rather apart of the Small Cats (more closely related to your domestics!). A common characteristic of all the small cats, which cougars share, is purring! The largest of the big cats, tigers are solitary mammals that originate from Russia, Asia, and India. They inhabit rainforests or swamps and usually prey on ungulates such as deer. A fully grown tiger can reach up to 600 pounds and have been known to live up to 20 years old. Their numbers have declined drastically over the years, with less than 4000 remaining in the wild today. This is due to both habitat destruction and hunting. Come walk our cat line and stand less than 5 feet away from our Siberian Tigers. Our biggest of all the cats, Storm, is approximately 550 lbs and can stand up to 8 ft tall. 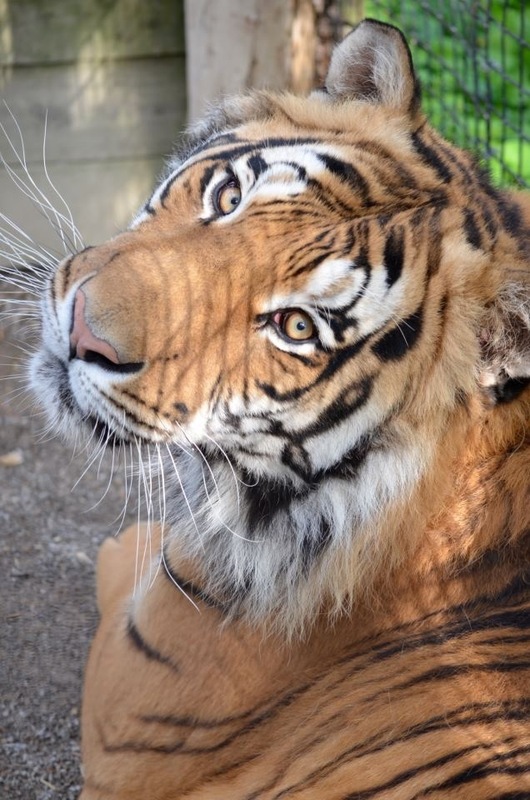 Be sure to tell him how handsome he is and he may “chuff” back at you – a common greeting vocalization of tigers. 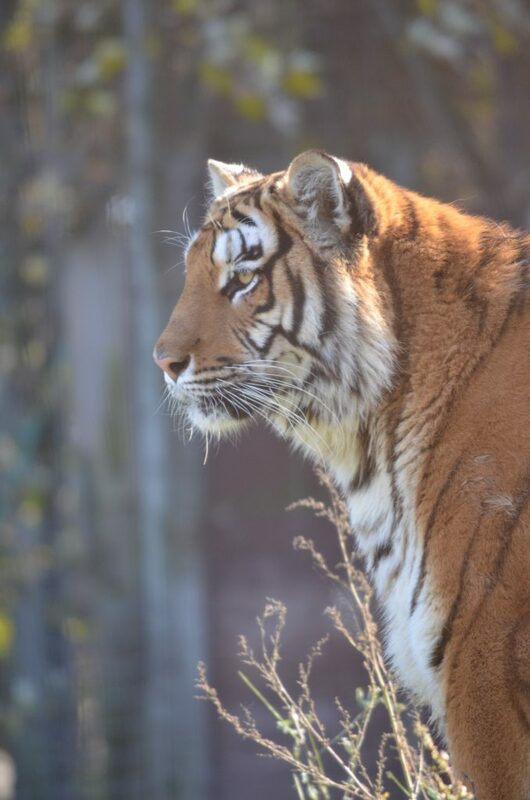 Enchantress, our female Siberian tiger, is quite the sight. If you catch her out in the pond run on a hot day, you may get to see her taking a running jump into her swimming pond. “Chanty” although not too interested in Storm, loves the male lions. When she’s not hanging around the pond, you may see her eyeing both Colussus Maximus and Lex Luther. 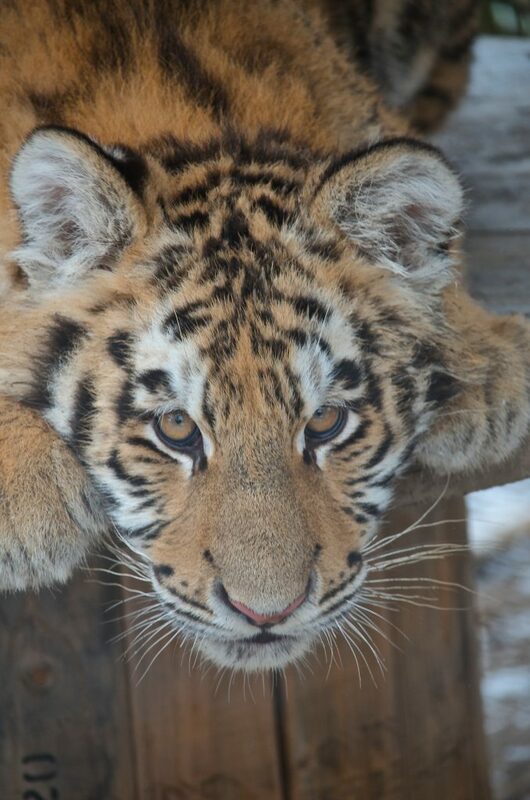 Vladimir, one of our newest additions to the tiger family, arrived this past Christmas. At only 1 year old, “Vlady” has grown up to roughly 150 lbs. 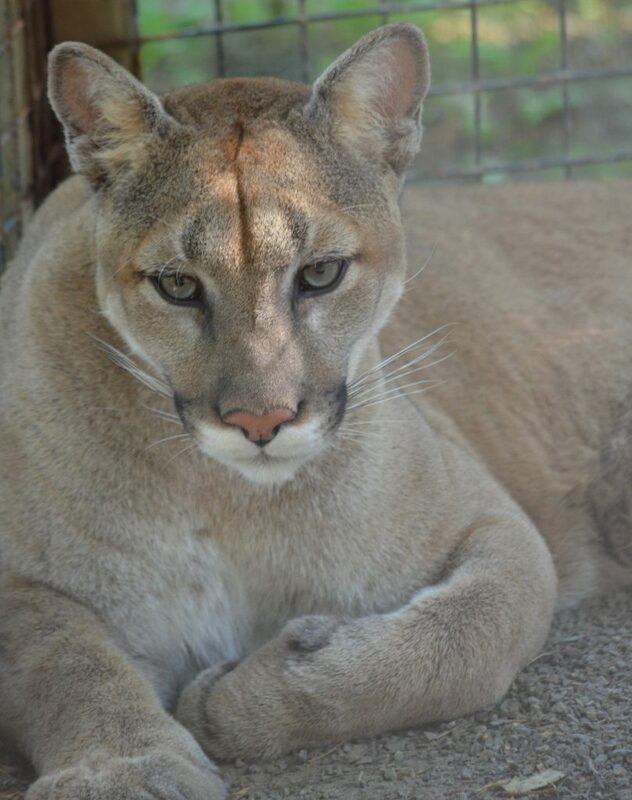 Temporarily living beside the cougars, Vladimir will be moved later this year to his own enclosure next to Enchantress in the pond run. One of his favourite past times is rolling around in his pool bath, but watch out when he shakes!